Instant Pot Honey BBQ Chicken Sandwiches are an easy and delicious dinner perfect for weeknights. 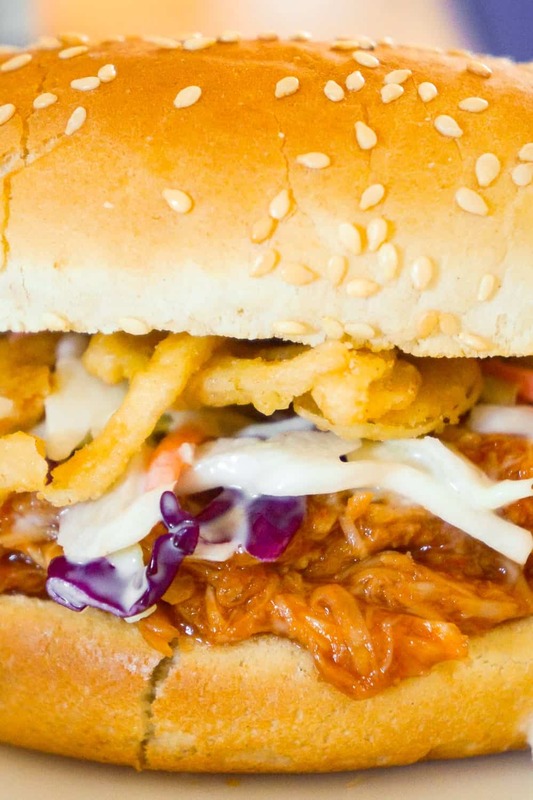 These shredded chicken sandwiches with honey BBQ sauce are topped with coleslaw and French’s fried onions. 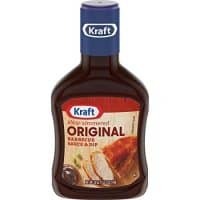 To make these barbecue chicken sandwiches, I started by pouring a can of condensed chicken broth into the Instant Pot followed by some water, a small amount of BBQ sauce and some onion powder. I stirred the ingredients together until the BBQ sauce was completely dissolved in the liquid. Then I placed some boneless, skinless chicken breasts in the pot. Then I set the Instant Pot to Pressure Cook High for 12 minutes. Once the Instant Pot was done cooking, I turned the steam release handle to the venting position and did a quick release. I removed the cooked chicken breasts from the pot and used two forks to shred them. I set aside 1/2 cup of the cooking liquid from the Instant Pot and discarded the rest. 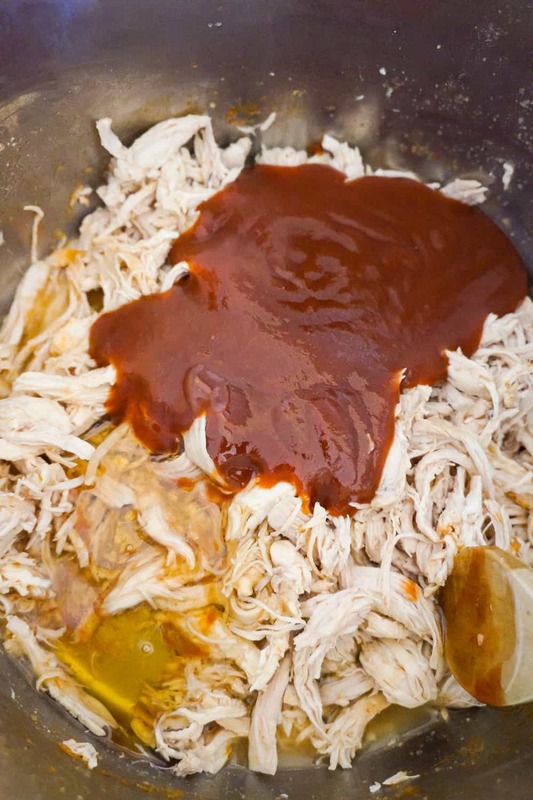 Then I returned the 1/2 cup of liquid to the pot, along with the shredded chicken some BBQ sauce and honey. 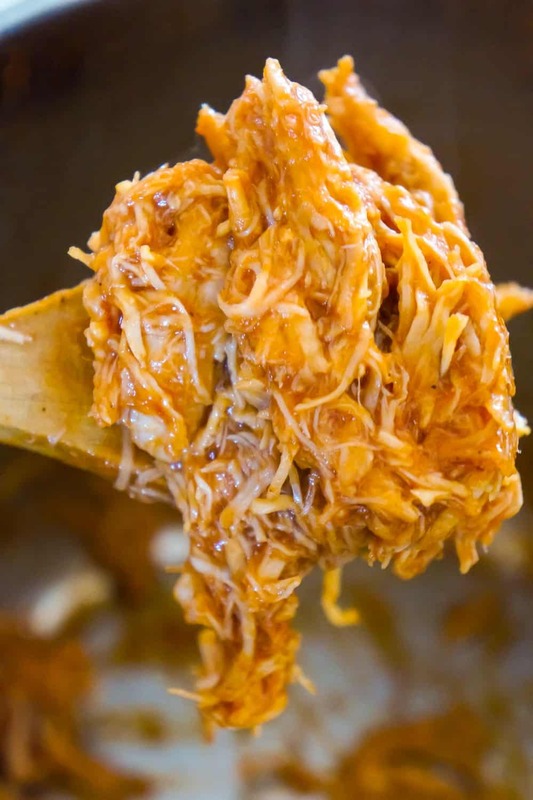 I stirred all of the ingredients together until the shredded chicken was completely coated in sauce. Then I set the Instant Pot to Saute Normal for 10 minutes. I left the chicken to simmer in the sauce, stirring occasionally so that nothing stuck to the bottom of the pot. While the chicken and sauce were simmering I poured some shredded coleslaw mix into a mixing bowl and added some creamy coleslaw dressing. I stirred the coleslaw until it was completely coated in the dressing and then set it aside. Then I lay some large hamburger buns on a baking sheet and toasted them in the oven. When the chicken was done cooking, I scooped it on to the hamburger buns. Then I placed some coleslaw and French’s fried onions on top of the chicken on the buns. 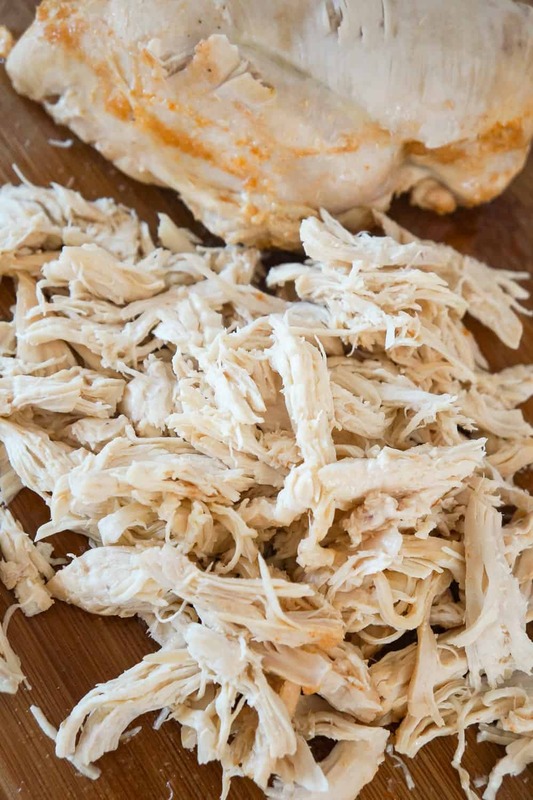 These shredded chicken sandwiches are tender and juicy. 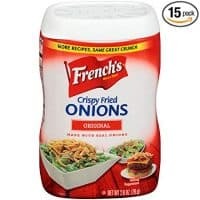 The coleslaw and French’s fried onions add great texture and flavour. 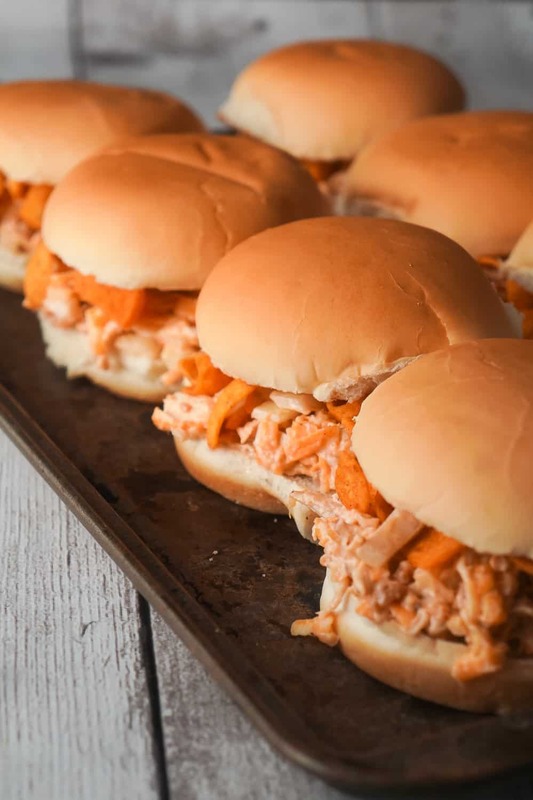 If you are looking for an easy Instant Pot chicken dinner idea, then you need to try these Instant Pot Honey BBQ Chicken Sandwiches. 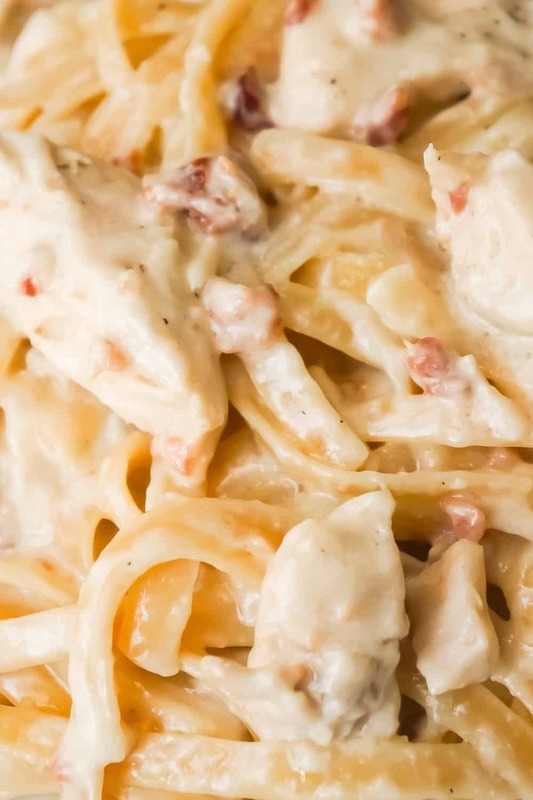 Be sure to also check out this Instant Pot Bacon & Chicken Fettuccine Alfredo! Another tasty chicken sandwich recipe. Check out these BBQ Fritos Chicken Sandwiches! 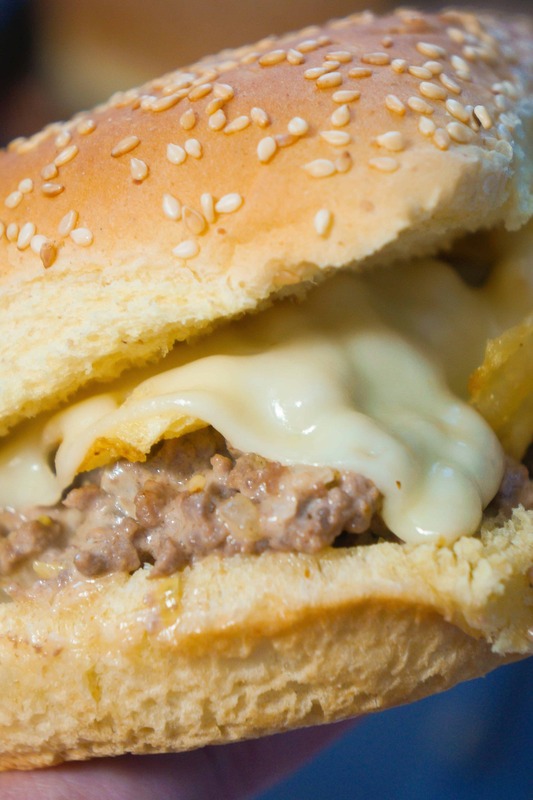 Be sure to also check out this Potato Chip Loose Meat Sandwiches! Instant Pot Honey BBQ Chicken Sandwiches are an easy and delicious dinner perfect for weeknights. 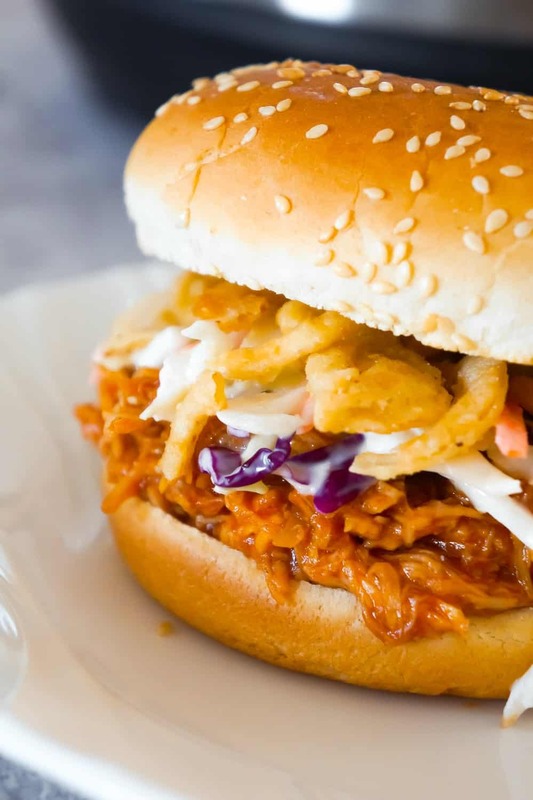 These shredded chicken sandwiches with honey BBQ sauce are topped with coleslaw and French's fried onions. 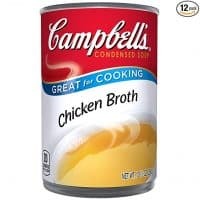 Pour the condensed chicken broth, water, 1/4 cup of BBQ sauce and onion powder into the Instant Pot. Stir well until the BBQ sauce is completely dissolved into the liquid. 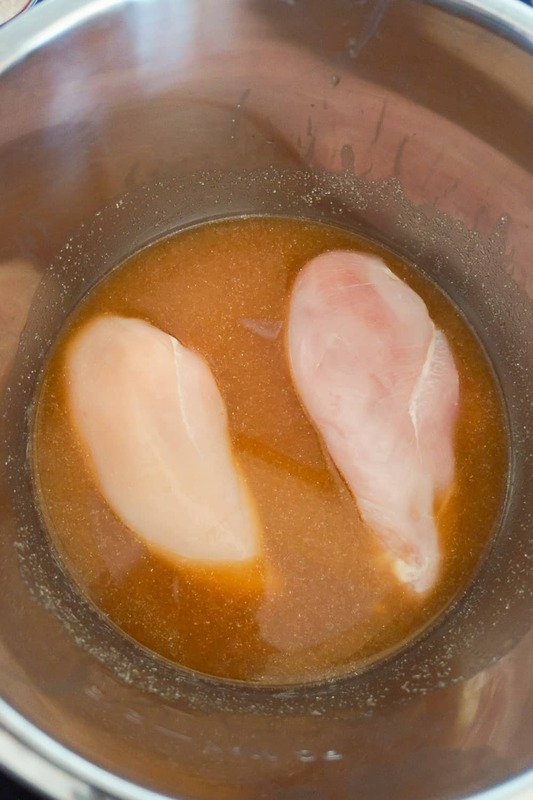 Place the chicken breasts into the liquid in the Instant Pot. Set the Instant Pot to Pressure Cook High for 12 minutes. Once the Instant Pot is finished cooking, turn the steam release handle to the venting position and do a quick release. 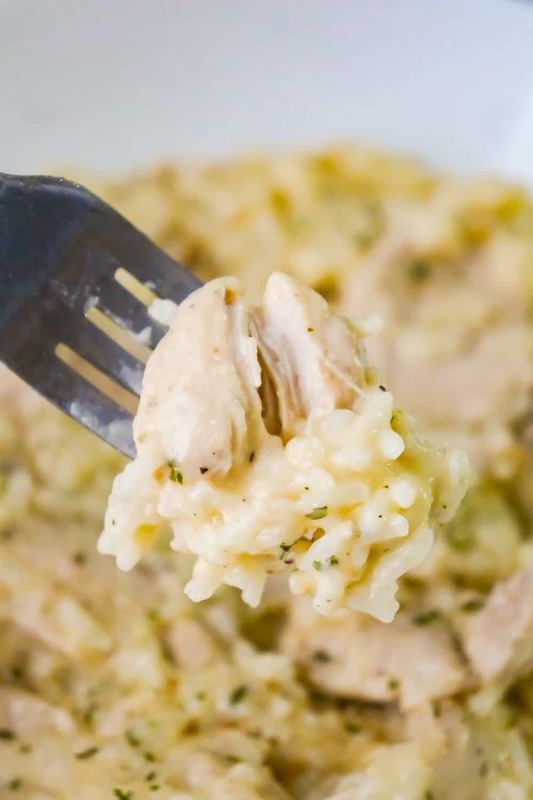 Remove the cooked chicken breasts from the Instant Pot and use two forks to shred them. 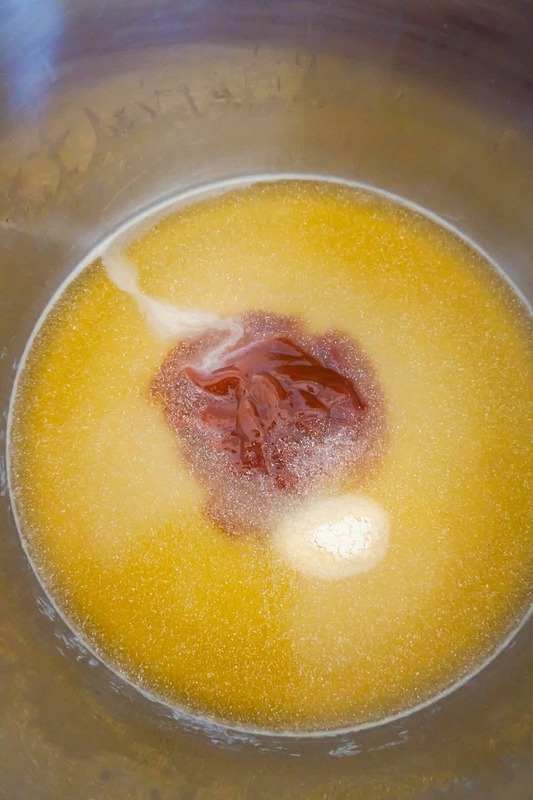 Set aside 1/2 cup of the cooking liquid from the Instant Pot and discard the rest. 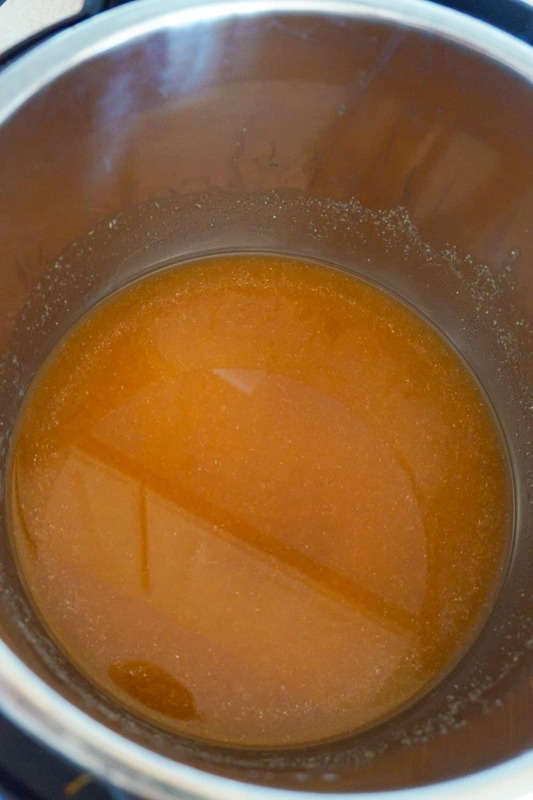 Return the 1/2 cup of liquid to the Instant Pot. 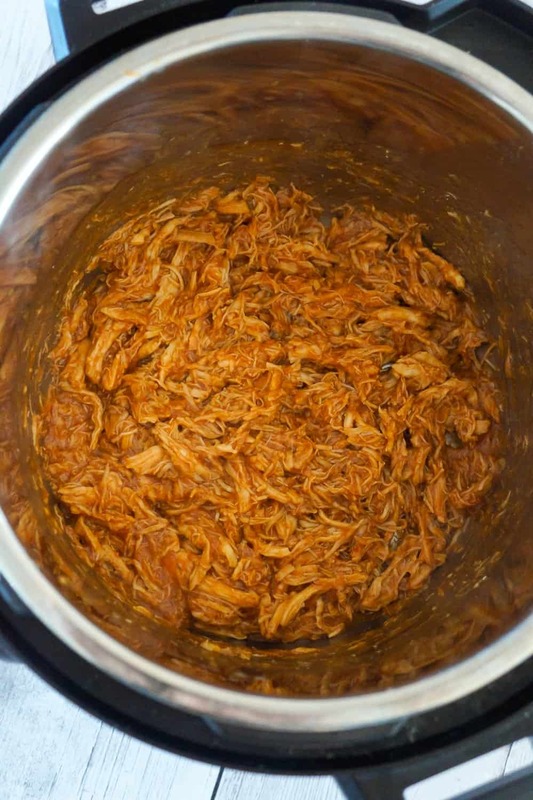 Add the shredded chicken, 1 cup BBQ sauce and honey to the Instant Pot. Stir well until all of the chicken is coated in sauce. Set the Instant Pot to Saute Normal for 10 minutes. Leave the chicken to simmer in the sauce, stir occasionally to ensure nothing sticks to the bottom of the pot. While the chicken is simmering, pour the coleslaw mix and dressing into a mixing bowl. 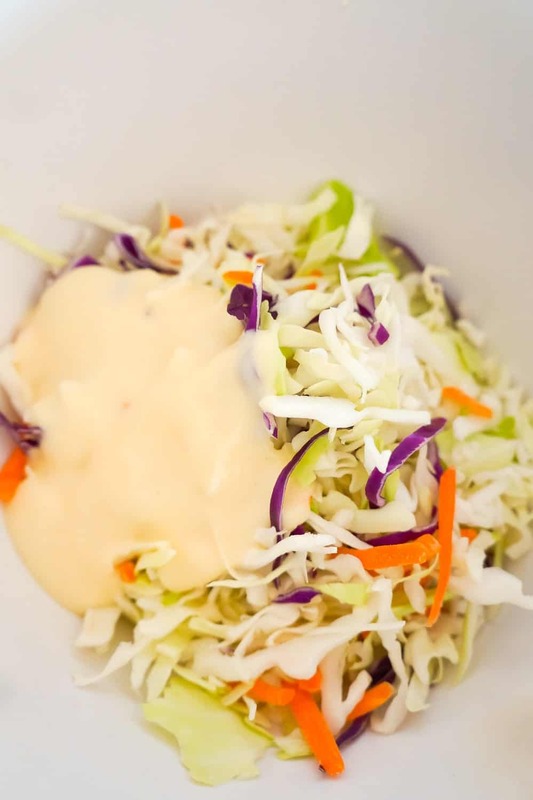 Stir until all of the coleslaw mix is coated in dressing and then set aside. Toast the hamburger buns in the oven or toaster oven if desired. 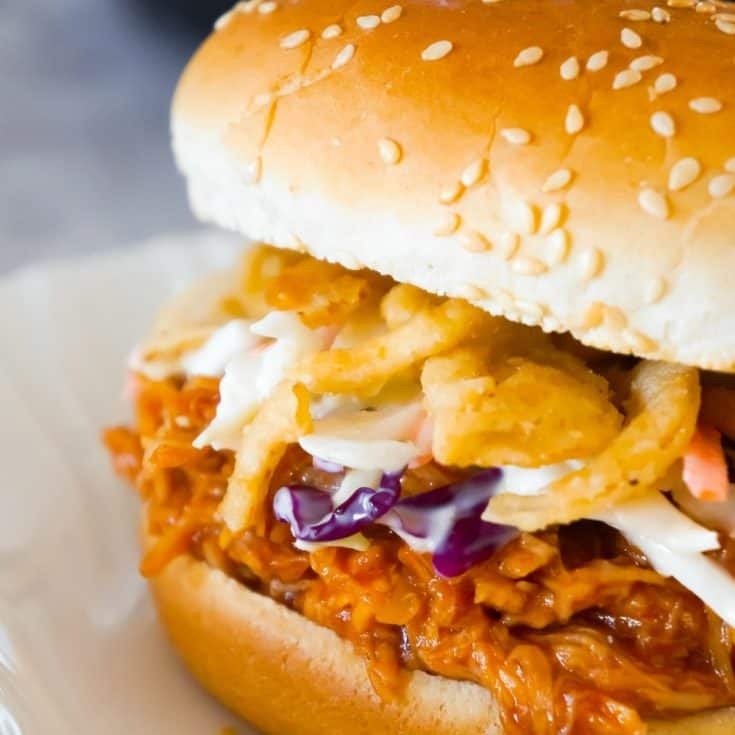 Spoon the chicken onto the hamburger buns and top with coleslaw and French's fried onions.